Status: Contest finished on 26-04-2010. Another remix comp organized by MXP4, the remix community. This time the track to work on is “Walking on a line” from the band Pony Pony Run Run. Good luck! 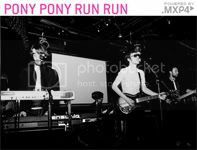 Pony Pony Run Run is offering you the chance to engage artistically with them by giving you access to their music and allowing you to remix it with complete artistic freedom. Whether you are a singer, producer, dj, musician or all the above, make this track yours. All music must be 100% original content. All you have to do is enter your email address and you will receive all the stems for “Walking on a line”. When you are finished with your remix, post it here. You and other fans can then vote on your favorite. The winner will be selected by the band and will have a digital release of “Walking on a line”, an autographed T-shirt and 2 tickets for a choosen concert date of Pony Pony Run Run (Transport and hosting not included). The four Runners- Up will each receive an autographed Tshirt and an autographed vinyl. Update: the contest was extended to April 26!